Invented in New Zealand, the bungy jump has got to be the biggest adrenaline activity. You can jump where it all started in Queenstown or in other locations across NZ. Go for the highest jump or choose a unique location at night over Queenstown or off the Auckland Harbour Bridge. Make sure you get some photos to show to friends and family back home! 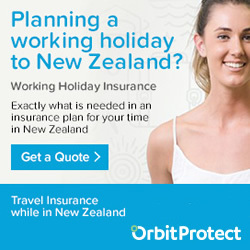 New Zealand is the birthplace of the bungy jump, so to go home without doing one would be almost criminal. As the masters of Bungee jumping, it is no surprise that the choice of where and how you can bungy jump is pretty extensive. So whether you want to get your head wet (or stay high and dry), do it with your best buddy or just simply jump from the highest jump possible New Zealand will certainly accommodate your jumping desires. 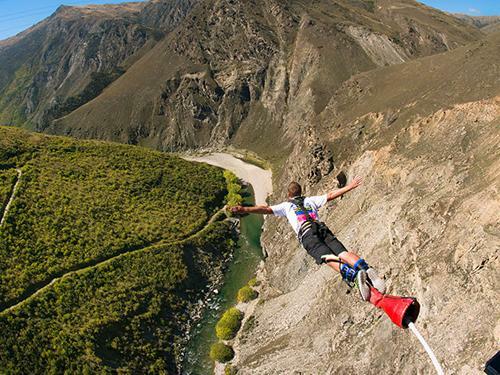 Here’s our rundown of the best bungee jumps in New Zealand. We have also included a handy guide at the end of the article so you can easily compare prices, jump heights and weight restrictions. 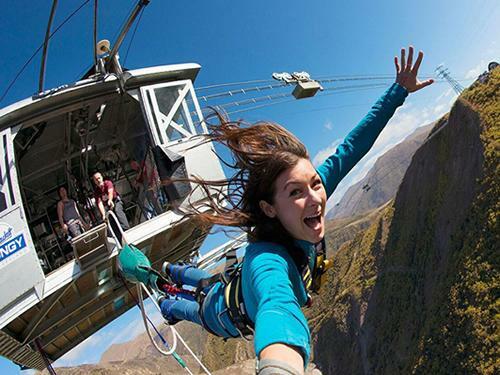 Spread between the rocky hills on the banks of the Nevis River, visitors to the Nevis Bungy and Swing in Queenstown are confronted with the highest bungy in all of New Zealand – and the 3rd highest in the world. So if you are a ‘go big or go home’ type of person, then this is the bungy jump for you! Jumping from a platform suspended 134m high above the Nevis Canyon floor you’ll experience over 8 seconds of continuous freefall making this one of the country’s must do experiences. To get out to the platform itself, you’ll take a slighty scary cable car ride. Afterwards you’ll head back via 40min 4×4 drive through the rugged gorge terrain. And if plunging the 134 metres towards the canyon floor has left you hungry for more excitement then there is the option to double up and have a ride on the Nevis Swing – the largest of its kind in the world. Of course there is also no shame in returning back home, proud in the fact you have jumped from the 3rd tallest bungy in the world. You’ll even get a certificate and post jump t-shirt to prove it. 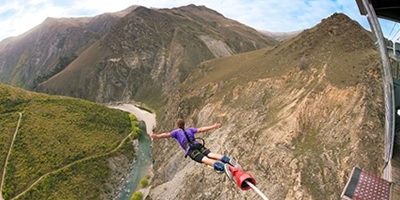 Billed as the most popular introductory bungy jump in New Zealand, there are lots of reasons to give this one a go. Unlike your classic, scenic bungees such as the Nevis or Kawarau Bridge – this 43m bungy thrill ride is a great option for those wanting to save a bit of cash while still ticking off a bungy from their bucket list or maybe for those who are completely petrified and want to try something a little less daunting before moving on to bigger bungys. 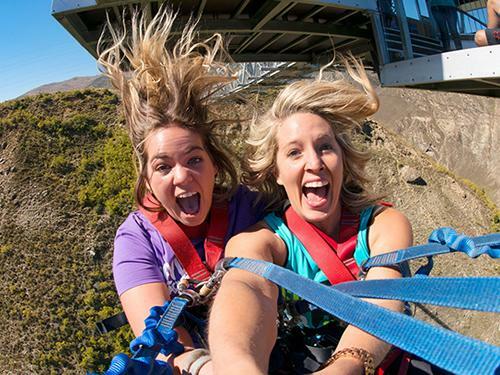 The team at Velocity Valley will make sure you are fully harnessed up before you take the 43m leap into thin air – though don’t underestimate it – this is still a bungy and the same height as jumping from the Kawarau Bridge bungy and taller than the Auckland Bridge bungy. Located in the purpose-built Velocity Valley means you’ll also be able to try your hand at the other adrenaline activities in the park such as the agrojet, swoop and shweeb racer. Kawarua Bridge is the birthplace of the first commercial bungy so taking a jump from here will make your already memorable experience that little bit more special. And if you are wondering where the audacious AJ Hackett made his first jump from – then that was from the Greenhithe Bridge in Auckland back in 1986. Still hugely popular, and probably one of the most iconic jumps in New Zealand, the Kawarau Bridge Bungy is located on the historic Kawarau suspension bridge which spans the stunning Kawarau gorge. Jumpers can choose between the classic single-person jump, water-touch jump or tandem jump, for those who want to share in the excitement/absolute terror. 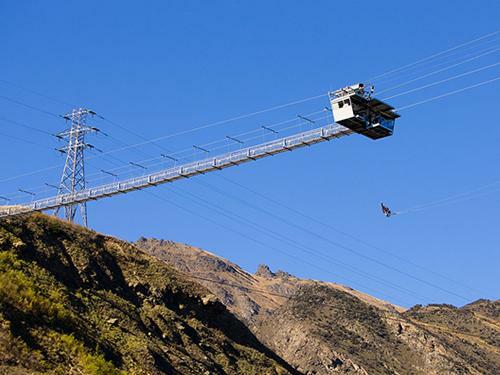 And if you are still in need of a little more excitement afterwards, then many jumpers choose to have a ‘flight’ on the Kawarau zipride – where you will zip down a 130m line at over 60k’s an hour. This 35m jump is not to be underestimated and will certainly give you the thrill ride you are after from a bungy. And while it’s admittedly not in the same league when it comes to height as some of the other bungees, it still delivers an epic jump. The jump platform is located on a historic bridge over an idyllic alpine river setting, so as it goes, this is probably the most scenic of all the bungees in New Zealand. The other great thing about the Hamner Springs bungy is its location – in the heart of an alpine playground – where you can double up or even triple up your day of adrenaline with activities such as jet boating, white water rafting or quad biking to name a few. 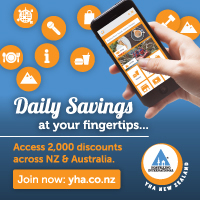 Take a leap from the iconic Auckland Harbour bridge 40 metres down into the river below. Not only does the Auckland Bridge Bungy offer the only salt water, ocean touch bungy in the whole of New Zealand, but it’s also the perfect way to catch up on a bit of sightseeing at the same time! As you'll be treated to great views of the city's Waitemata Harbour but maybe not while you are free-falling! You will probably also gather a few smiles (or gasps) from the passing boat cruises and jet boat tours who nearly always stop to watch you take your leap of faith. And being in Auckland means this is a great option if you are short on time and still want to fit in the NZ Right of Passage. Perched precariously high above Queenstown is the Ledge Bungy, which offers up some amazing views of the Queenstown skyline and snowy Southern Alps beyond. It is indisputably one of the most iconic jumps in all of New Zealand and the only one where you can freestyle the hell out of your jump! Attached via your waist to your bespoke harness means that you can go all out with your 47m jump - so whether you are going for a somersault, flip or twist – means this bungy adds that little something extra to your unforgettable moment . And run by the masters of modern day bungee – AJ Hackett – means you are in super-safe hands. Not necessarily the first place you may associate with the extreme sport of bungee jumping – but don’t let this lovely town of Taupo fool you. Perched 50 metres high above the Waikato River, the team at Taupo Bungy are the supreme masters of the water touch bungy – so whether you fancy the tiniest of splashes or full on body submersion – this is the jump for you. This makes this bungy the highest water touch bungy in New Zealand. And if you are still hungry for more adrenaline then there is also the option to double up and take a 70kp/h ride through the panoramic scenery on the Extreme Swing.